Waste rubber recycling line refine rubber to waste rubber oil.Waste rubber recycling to fuel oil plant take high temperaturepyrolysis technology to get waste rubber oil refined.After waste rubber oil refining,waste rubber oil production can be usd as good fuel material.This waste rubber oil recycling manufacturer is committed to environmental sustainability by refiningwaste rubber recycling to fuel oil.Waste rubber recycling line build an eco-friendly system.Waste rubber oil refining system also can be called ‘gold mine’ for converting waste rubber to oil production.There are 7 main parts in the waste rubber recycling to fuel oil line.Combustion system of the waste rubber oil refining system can be designed furnace door,oil burner or gas nozzle.Buffer chamber purify waste rubber oil gas to avoid gas jams and slow down speed ofwaste rubber oil gas to ensure the whole waste rubber oil recycling system under safe pressure. 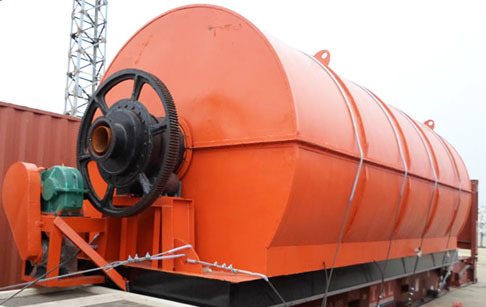 The working process of the waste rubber oil production plant is semi-automatically operating . Firstly,feeding waste rubber into the reactor by auto feeder machine.Secondly,heating the reactor of waste rubber recycling line by coal,wood or diesel oil.The the waste rubber oil gas will come out through cooling system into waste rubber oil liquid.The cooling system of the waste rubber recycling line is crucial for waste rubber oil output.There are 2 safety devices in the waste rubber recycling manufacturer to guarantee the oil gas going smoothly in the whole waste rubber recycling system.The exhaust gas coming out of the waste rubber oil refining line can be used for heating reactor again.After finishing the waste rubber oil refined process,carbon black will be discharged automatically from the waste rubber recycling system.Lastly,when the temperature of the waste rubber oil recycling manufacturer falls to 100 centigrade, workers could open the door of reactor .Then can start the waste rubber oil refining system to another batch working. If you wanna to get more details about Waste rubber recycling line you can send E-mail to market@doinggroup.com. You can consult our professional engineer and specialized sales team with leave a message in below form.We will contact with you ASAP.You also can visit our factory in Henan,China.Get Detailed address.